Happy Kitchen Sink Stamps Monday! It's also Challenge Monday in the Kitchen, I'm your hostess this month. This months Challenge theme is Stitching (use any type of stitching on your creations). I've got two cards to share with you today, both are created using the Drywall Stitching Technique, it's quick and easy! Besides who really has time to drag out the sewing machine! Isn't he cute! 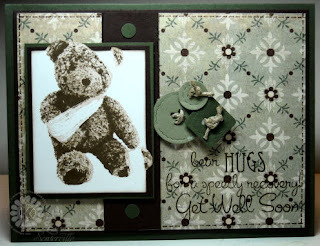 The bear image is from Kitchen Sink Stamps 3 Step Get Well Teddy, stamped as follows on White card stock (all ink SU unless noted) #2 Soft Suede stamp off, #3 Soft Suede, #4 Soft Suede, #1 Creamy Caramel. After stamping, I used the Out of the Box Technique. The sentiment is made up using words from the 3 Step Get Well Teddy and the word HUGS from a new sentiment sheet being called Simple Sentiments being released next week. Yep, new KSS images will be arriving in the Kitchen next week, and I can't wait to share them all with you! Don't forget you can save 10% on all your Kitchen Sink Stamps purchases by using code LISA10KSS. 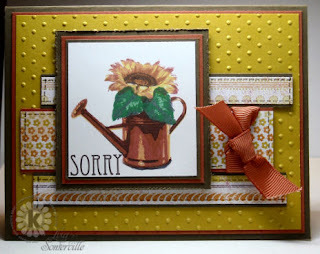 This next card features the Multi Step Sunflowers, again the sentiment I used is from Simple Sentiments, being released next week. For this card, along with the Drywall Stitching Technique, I did quite a bit of masking. The sunflower was stamped first, masked with Eclipse Tape, then I stamped the leaves, masked those, then added the watering can. Quite a bit of work, but I just love the outcome! What are you waiting for? Grab your Kitchen Sink Stamps and play along for a chance to win some great prizes! Remember only entries that use 100% Kitchen Sink Stamps are eligible for the random prize drawing - read full deails on the challenges here. Thanks for this fun challenge, Lisa! Your faux stitching on both cards is gorgeous!! Fabulous layouts and stunning colors and papers!! More exquisite work from the master!! Both cards are fantastic. I love the way you use the Kitchen Sink stamps. What a great challenge this was! Such great cards too. I love that teddy bear, you did such a beautiful job with the buttons and your "stitching." FABULOUS!! Love both cards!!! love the faux stitching too! Beautiful cards today Lisa! The teddy bear looks great in those colors! :) Fun challenge too! Both cards are so beautiful, Lisa! Love the way you used the colors and embellishments. Great challenge, and 2 beautiful cards, can't wait to see the new releases. Love your beautiful samples and hope to take part in this challenge later. You know I am a big fan of your style!!! Lisa, this has been such a fun challenge to do. All your cards are very inspiring. !